Did you know that pollutants are 100 times higher indoors than outdoors? Air quality in our homes is so important. It is the air that we breathe day in and day out, exposed to constantly and consistently. The quality of the air in your home can affect asthma, and exacerbate many other health problems. Home Air Check is here to help! Their convenient service allows you to effectively test the air quality in your home, whenever it suits you. I come from a big family, and my mother, as well as my two brothers, all have asthma. Our entire apartment was filled with carpet that was 40+ years old---the only exceptions being the linoleum that was installed in the kitchen and bathroom. It had never occurred to us that maybe there was something we could do about it. I wish we had Home Air Check back then, perhaps with their services we would have discovered any problems much sooner, giving us the opportunity to address and rectify them. You can find out more about the benefits of testing the air in your household by clicking here. 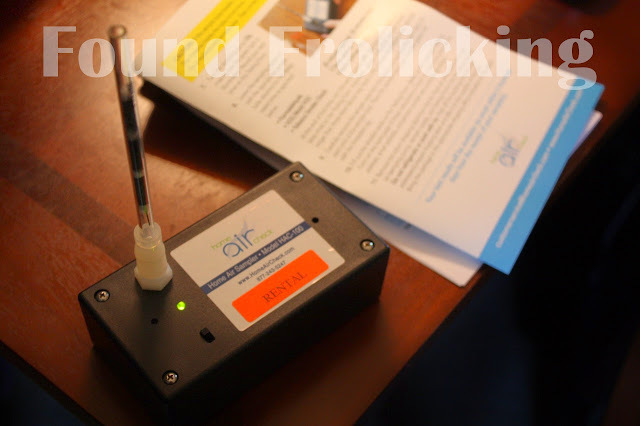 Mold, tobacco smoke, formaldehyde, and volatile organic compounds (VOCs) are very big factors in air quality that Home Air Check can detect. New homes and old homes alike are vulnerable to these harmful chemicals and air pollutants and can lead to breathing problems, irritation, and even illness. Home Air Check uses professional grade air test kits, and then analyzes each test sample using a state-of-the-art air testing laboratory. You can find out what else makes Home Air Check the #1 home air test by taking a look at this list. Getting to know your air can also bring you peace of mind. 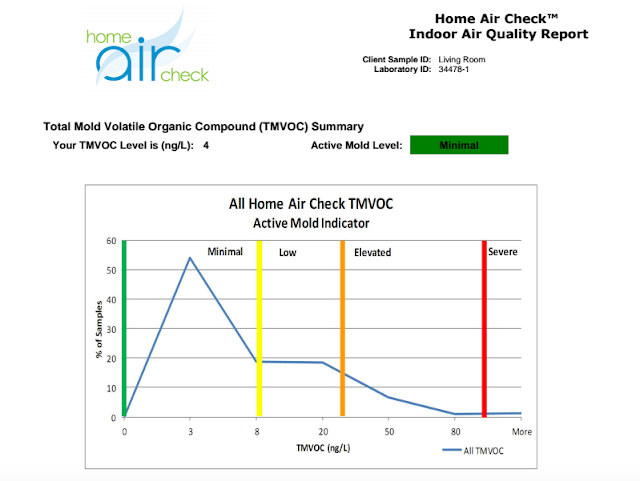 I had been having concerns about potential mold growth in our home for some time, knowing that dangerous mold growing in your home can pose many risks, and Home Air Check gave me the opportunity to find out what was really going on. The VOC + Formaldehyde Test was just what I needed! I was very pleased with the simple-to-follow instructions and the overall ease of the testing process. I reviewed the instructions several times just to make sure I collected each of the air samples properly. Each sample tube was conveniently labeled so I knew which sample I was taking. The pump that pulls air through the sample tube for testing was extremely simple to use, functioning off of a basic on-off switch! Initially I was concerned about how much time it would take to collect the test samples so I could send the test kit back for analysis, but I soon found out I had nothing to worry about. It only required several hours of time out of my morning, and only a few minutes of that was hands on! I was able to do chores while waiting for each sample to be collected, which worked out perfectly. Each sample has a time frame specified for the ideal time to collect a sample for, and then you simply record the time you started and stopped collecting the sample. I used a timer on my phone to ensure I collected each sample for the ideal amount of time. 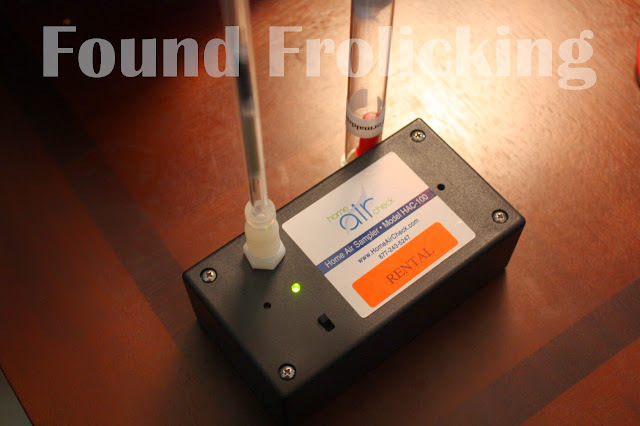 An important aspect of the testing process with Home Air Check to keep in mind is that it is test sensitive. From the time the product arrives at your doorstep, you will have about two weeks to complete the test and mail it back to Home Air Check for analysis. It may be a little work to create the ideal testing conditions as well, to make sure that the test results aren't affected by temporary changes in your household's air quality, as can be the case with cooking occurring in your home. I personally recommend exploiting the excuse to eat take out or dine out with your family, and conducting the test the following morning. Once you have completed the testing process, all you have to do is package the kit products back into the box to safely make their way back to Home Air Check. You can drop-off the Home Air Check kit at a convenient drop-off location near you, using the prepaid label provided in your kit. The laboratory will process the samples and send you a report with the lab results. It was a huge relief to receive my results back from the lab so that I finally knew what was going on in my household. 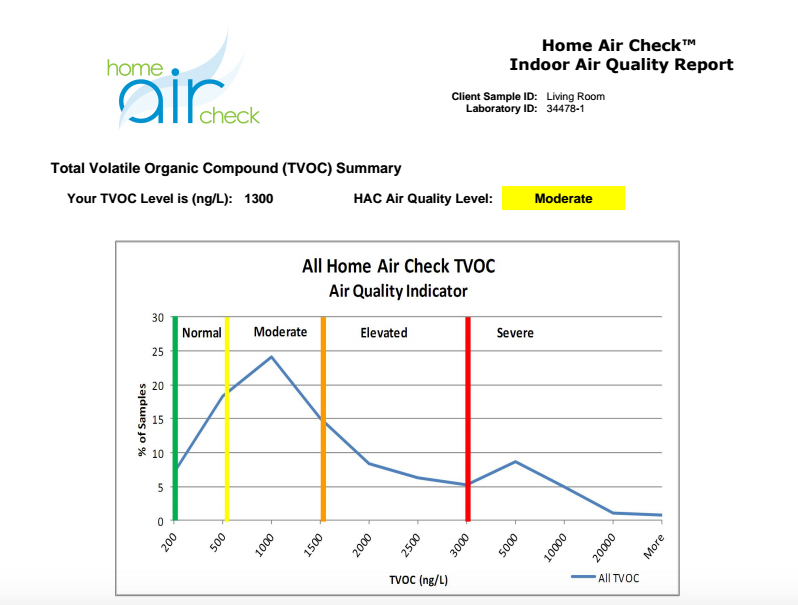 I confidently recommend all families to take charge of their household air quality, which all begins with Home Air Check. Order a test kit today! To find out more about Home Air Check, please visit their website. Home Air Check offers a VOC Test, Tobacco Smoke Test, Formaldehyde Test, and their most popular, the VOC + Formaldehyde Test. Prices for testing kits start at only $85.85. You can find out more about testing directly, and the answer to any questions you might have by clicking here. You can also find Home Air Check on their Facebook page, and follow their boards on Pinterest. Use the code Lalia20 during checkout to receive $20 off! 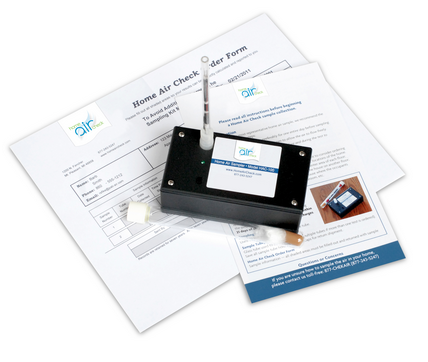 The instructions provided with your Home Air Check testing kit are informative and easy to follow. Collecting the air sample for the Formaldehyde test. 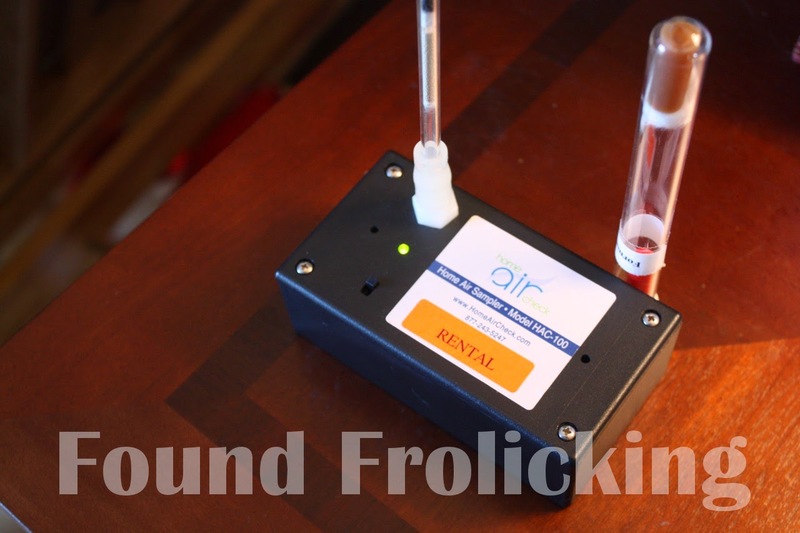 Testing with Home Air Check is effortless, and requires very little supervision while air samples are being collected. 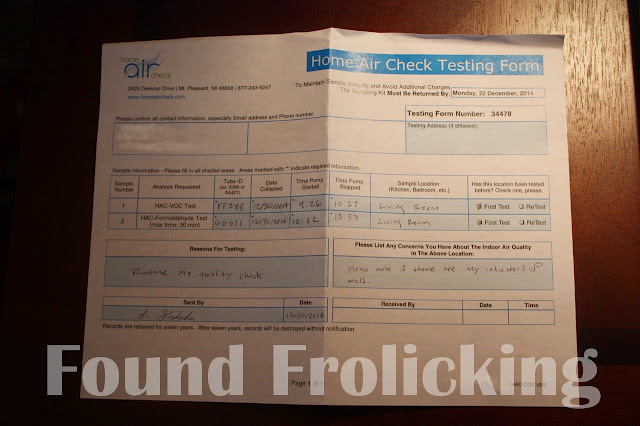 A look at the Home Air Check Testing Form to complete during the collection of samples. This image shows the graph portion of my report for the VOC testing. This graph is a great example of one aspect of the report that will be sent to you from Home Air Check. Disclosure: This is a sponsored post. I received monetary compensation in exchange for writing this content. All opinions expressed are my own, and were in no way influenced by the brand or any other sources. The post and all photos with the watermark are the property of Found Frolicking, and should not be used or distributed in any way without first receiving permission. Found Frolicking is in no way responsible for prize shipment, but will work with the sponsors in all ways possible to ensure the winner receives their prizes. Find out how Found Frolicking can help promote YOUR business! If you would like to work with Found Frolicking for a review, giveaway, advertising, or promotion of any other nature, please email Lalia at found.frolicking@gmail.com. I am sure the air quality in my house isn't great. I would love to test it. I'm both intrigued to know and scared to know about the air quality in my home. I've tested air when selling homes before, but I've never had to check this house yet. I want to rip out the carpet in our home. It's in need of replacing but with severe allergies I know the carpet isn't healthy. I'm wanting to put in hard wood flooring soon. We rented a home that we were very suspicious had black mold...and god knows what else! I was so grateful to finally buy our own home so we can more closely monitor things like this and make the improvements we needed. Relying on someone else like a landlord to do those things isn't always productive! This makes me curious as to what's in the air in my new home. Testing it sounds like a good idea. I would be interested in it. If you are interested in testing your indoor air quality with Home Air Check enter Lalia20 at checkout for $20 off. This is really a neat thing! I am definitely looking into one of these.